1. FHQ will not dive too far into all of this now. This is, more or less, a baseline to which the 2016 rules as they come more into focus can be compared. 2. This nicely highlights what FHQ said throughout the 2012 cycle: There just were not that many truly winner-take-contests. 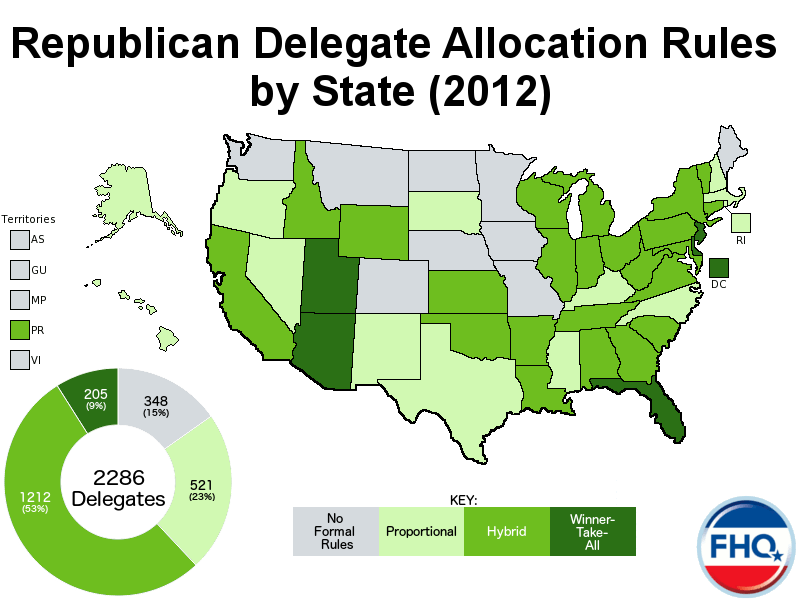 Though Idaho and Puerto Rico ended up allocating all of their delegates to the winner (in this case, Mitt Romney), those two were the only early (proportionality window) states that had conditional winner-take-all provisions that were triggered. The six truly winner-take-all states comprised only 9% of the total 2286 Republican delegates. 3. There could have been many more categories added to this, but FHQ erred on the side of simplicity. That "hybrid" group includes loophole primary states like Illinois where delegates are elected directly, winner-take-most (winner-take-all by congressional district) states like South Carolina and a host of other conditionally winner-take-all states. As FHQ mentioned in the rundown of 2016 proportionality rules changes, even if you reallocate delegates in states that fall in this category, the changes are not very much different than a proportional allocation. Again, this is a catch-all group of sorts, but with a tighter definition of proportionality for 2016, some of these states -- those in the proportionality window -- will likely drift over into the proportional category. Others with contests that fall on or after March 15 may end up in the winner-take-all category (see possibly Ohio). 4. While that "hybrid" group is still something of a mystery, the wild card in 2016 will be what happens with the bulk of the caucuses states; those with no formal rules binding delegates to candidates. Given the changes to the national party rules -- There is now a requirement that delegates be bound based on the results of the primaries or caucuses (with some caveats). -- the previously non-binding caucus states will have to devise rules for allocating delegates. As most have to start and complete the caucus/convention process between March and early June, most of the first steps in the process will be early. Whether those states fall in the proportionality window remains undetermined. But that does have an impact on the types of delegate allocation rules those states will be able to adopt. But in 2012, there were more delegates available in the "no formal rules" states than there were in truly winner-take-all states. Could the people who attend the caucus but do not vote be listed as uncommitted?